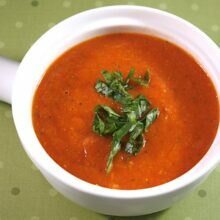 Roasted Red Pepper Tomato Soup-this simple, warming, and delicious soup makes a great meal and it freezes well too! I have also been making a lot of soup to try and stay warm. 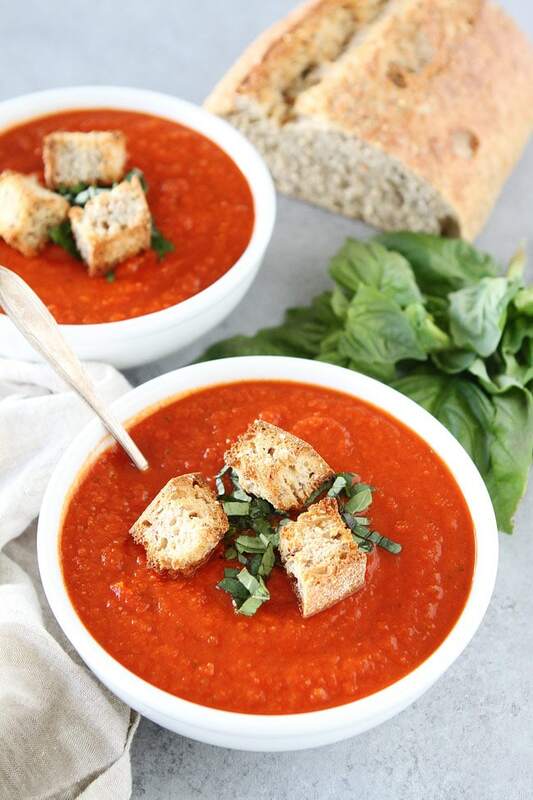 I made this easy Roasted Red Pepper Tomato Soup this week and it sure hit the spot! This is one of my favorite soups because it takes less than 30 minutes to make and I always have the ingredients on hand. The soup is filling, satisfying, and will warm you up! 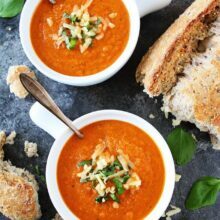 Tomato soup has always been one of my favorites, but I like this recipe even better because the roasted red peppers add an intense flavor. I also stir in a little Almond Breeze Original Almondmilk at the end to make the soup super creamy. I like to use the shelf stable almond milk because I always have it in our pantry. You will never know this soup is made without cream. It is so rich, creamy, and smooth! 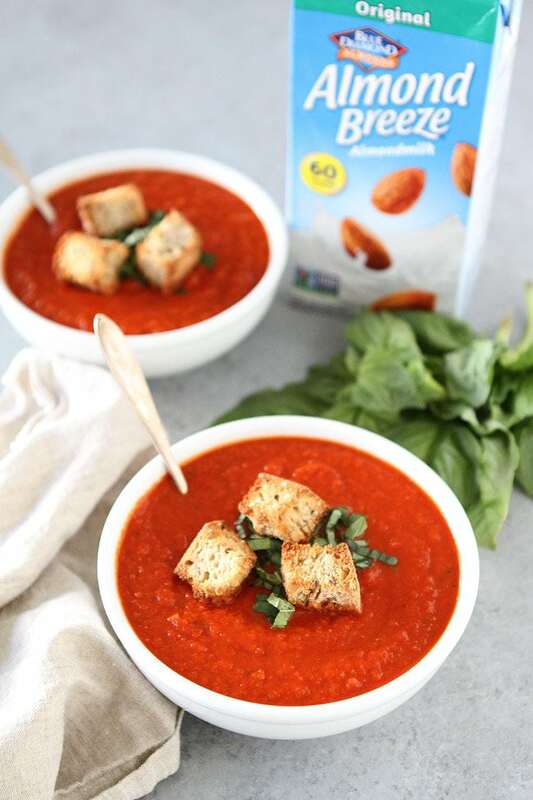 I like to top each bowl with fresh basil and homemade whole wheat croutons. You could also dip a piece of crusty bread into the soup or a grilled cheese sandwich. So many options! And I highly recommend putting some soup in the freezer for another day. It will save you when you are craving some healthy comfort food but don’t have time to make dinner. It has saved me on numerous occasions. 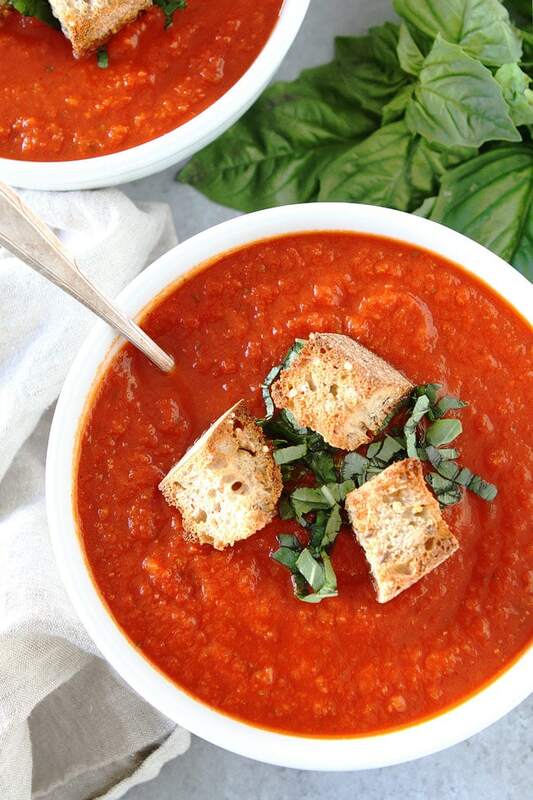 There’s nothing more comforting than a bowl of this simple Roasted Red Pepper Tomato Soup. It is perfect for this time of year! 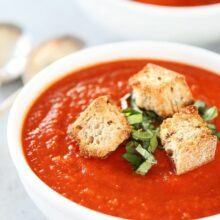 This simple and satisfying tomato soup is made with pantry staples and takes less than 30 minutes to make. In a large pot, heat the olive oil over medium-high heat. Add the onion, carrot, and celery and cook until soften, about 5 minutes. Add in the garlic, tomato paste, and bay leaves. Stir until the tomato paste is mixed in. Add the tomatoes, roasted red peppers, vegetable broth, sugar, dried thyme, and crushed red pepper. Stir to combine. Reduce to low and simmer for 15 minutes. Stir in the almond milk and basil. Remove the bay leaves. Turn off the heat and use a hand blender to purée the soup in the pot. If you don't have a hand blender, let the soup cool until warm and transfer to stand blender. Blend until smooth and return to the pot. Heat over medium heat until heated through. 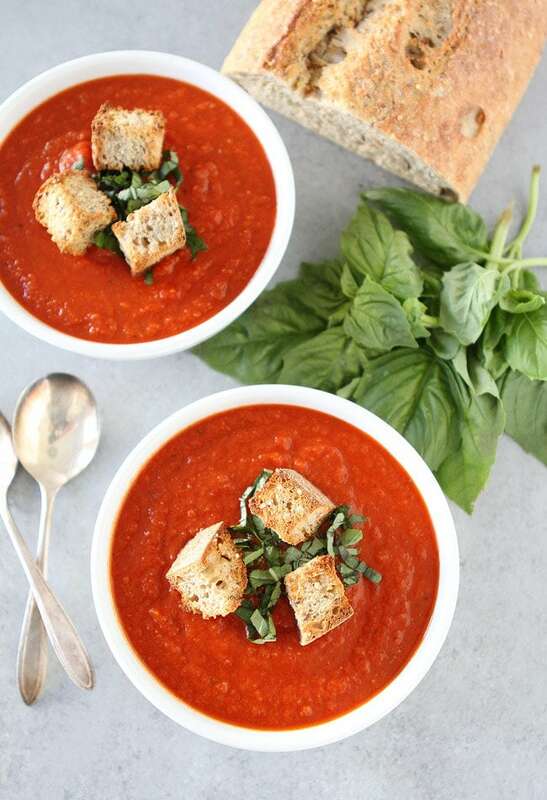 Ladle the soup into bowls and garnish with fresh basil and croutons, if desired. Note-this soup will keep in the refrigerator for up to 5 days. It also freezes well. To freeze, cool the soup completely and store in a freezer container for up to 2 months. 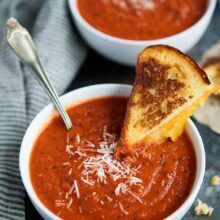 This is definitely one of my favourite flavours of soup, I love it with a cheese toastie! So good with a cheese toastie! 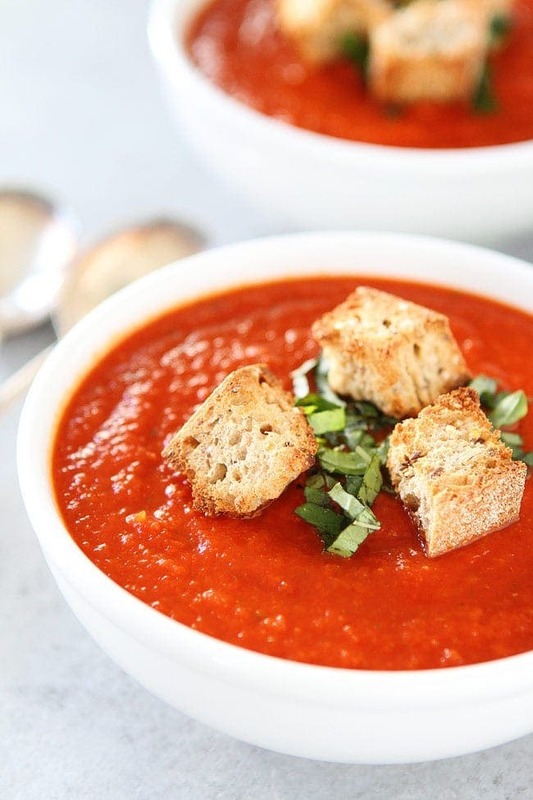 I love red pepper tomato soup and I love that you can make this one so quickly. I’ll definitely be giving it a try soon! I hope you like it! It’s so easy! Love how fast and easythis is! Super easy comfort food, the best! incredible recipe. I must try!!! This looks so good and I LOVE that it’s vegan! 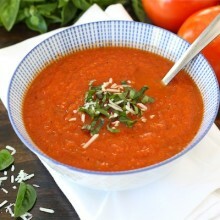 Love roasted red peppers in a roasted tomato soup! Yum! Such great flavor! Thanks Kevin! I love soups…,,all year round. This sounds so good! Know what I am making this weekend! I am into soups right now too! Enjoy! Looks so good! Do you think coconut milk would work, or would it change the flavor too much? My daughter is allergic to nuts, and is trying a vegan diet right now too! Yes, you can use coconut milk if your daughter is allergic to nuts. Enjoy! Coconut milk… very interesting twist to the recipe! So happy you posted this today! Working from home and doing Whole 30 – had not idea what I was going to do for lunch. Didn’t have the roasted red peppers, only had diced tomatoes and added more basil. Absolutely perfect lunch with two lunches left over! Thank you so much!! You are fast:) So glad you enjoyed the soup! Yay! And this is why I need a blender in my life! Fast and delicious! This is my kind of winter soup! Love how vibrant that red is! This looks really good, I will have to try it as I love soup! Where do you find roasted red peppers? Look in by the canned vegetables in the grocery store or in the Italian section. All stores should have them. They are in a jar. You can also easily buy a red pepper(or buy an extra 1 or 2) and throw in the oven until the outer pepper turns black. Put pepper(s) in a large Ziploc bag and allow to steam(10+minutes). After they cool, take out of bag and charred pepper skin should come off. Save extra peppers for another batch of soup or different recipe. Could it be made in a slow cooker and ready when I returned home. I’m assuming it would be cooked on low and the Almond Milk be added before serving? What can I sub for almond milk, 2% milk? so would this qualify as gluten free alternative to a guest that has food issues?